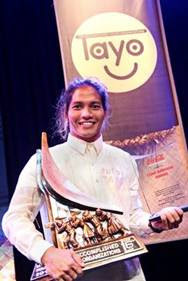 The Sun Crew, represented by co-founder and manager, Wemar Bonono, receives multiple awards as main winner and the Coke Barkada Awardee at the 16th Ten Accomplished Youth Organization (TAYO) Awards. 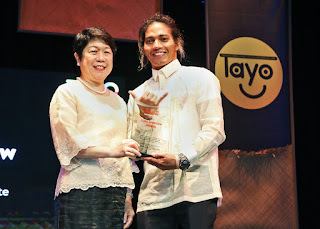 Coca-Cola Foundation president, Cecile Alcantara, awards the special Coke Barkada Award to Sun Crew co-founder and manager, Wemar Bonono, for the Sun Crew’s initiatives on education and environmental protection. “Actually, noong bata pa ‘ko hindi ako nag-e-eskwela kasi sobrang hirap ng buhay noon kasi wala pang tourists. Tapos ‘yung mga bata, ayaw ko rin na matulad sa akin. Marami silang nagtatanong kung pwede ba silang sumali at sabi ko ‘You’re welcome to join!’ Hindi kami namimili, basta nag-e-eskwela lang, ‘wag nila kalimutan yung pag-aaral, ‘yun ang importante,” shared Bonono. To improve the children’s school attendance and to provide them with skills that will alleviate them from poverty, the Sun Crew started the Smart Sustainable Surfers (SSS) program where children earn Surfer Points for attending school and participating in other programs in exchange for surfboard use and surfing lessons. The SSS program resulted in a 100% increase in school attendance, with students attending 4 to 5 times a week. Aside from motivating students to attend school; one of the main thrusts of Sun Crew is to make the children and the local community the custodians of the island’s environment. To address the increasing waste that is produced with rising tourist arrivals, Sun Crew conducts weekly beach clean-ups with the help of the Smart Surfers, locals, and volunteers; collects and segregates the waste of the barangay; and holds eco-bricking and up-cycling sessions. 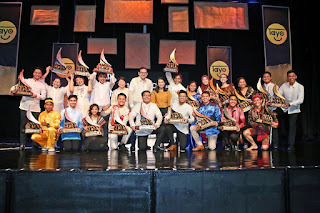 The twenty TAYO Awards finalists witness the fruits of their labor at the 16th awarding ceremony. With its goal of creating a sustainable and waste-free Siargao and uplifting local communities through education, the Sun Crew best embodies the Coca-Cola company values and is aligned with the company’s vision of a World Without Waste. In January 2018, Coca-Cola announced its commitment to collect and recycle one bottle for each that it sells globally by 2030 and the company continues to work towards this goal. The top ten accomplished youth organizations and the esteemed board of judges share the stage at the 16th TAYO awards. “Coca-Cola Foundation Philippines and TAYO go a long way. Our partnership began in 2005 through the Coke Barkada Award, a special recognition given to the TAYO finalist that shares our passion to improve wellbeing of communities with projects that are aligned with Coca-Cola’s sustainability priorities. We are grateful for this opportunity to stay connected to the youth through the TAYO awards,” shared Coca-Cola Foundation president Cecile Alcantara. 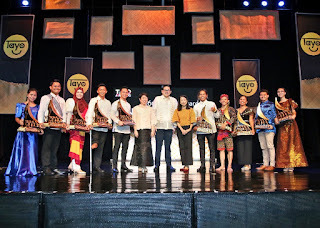 The other 16th TAYO Awardees were AQILAH (Marawi City), Association of Young Environmental Journalists (Dumaguete City), Center for Sustainability Philippines, Inc. (Puerto Princesa City), Cuartero National High School Taliamba Ensemble, FLMIS YES – O (Iligan City), MIMAROPA Young Leaders (Oriental Mindoro), Philippine Accessible Disability Services, Inc. (Lapu-Lapu City), Team BakUNAWA (Iloilo City), and Tuklas Katutubo – Upper Lumabat Chapter.